Will you benefit from a gutter guard installation? Michiana Gutter Pros recommends Gutter Helmet installation. We do so because Gutter Helmet is recognized as a high quality, dependable gutter guard that will keep your gutters free of leaves and other debris for years to come. 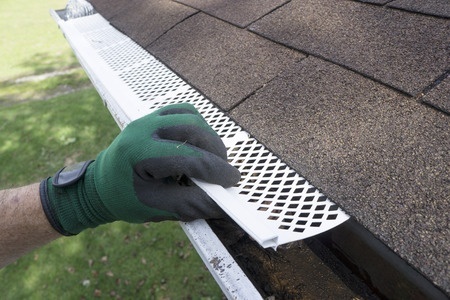 Our professionally trained workers will install your Gutter Helmet gutter guard the right way the first time. One of the main reasons gutter guards fail is because of poor installation in Mishawaka, Indiana. That's an experience we just won't let you have. Gutter guards can help keep the rainwater flowing freely through your gutters and down the drainspout. In other words they help the gutters do the job they're designed for: diverting water from your roof so it won't cause damage or attract pests. By preventing build ups of leaves and other debris gutter guards make sure the water flows like it's supposed to flow. We can fix faulty gutter installations and other mistakes. Did you get snookered by an expert smooth talker posing as a gutter installation expert.? Are you wondering how you'l ever correct the shoddy work she performed? Maybe you tried to do your own gutter guard installation. You tube is a popular source of gutter guard installation instructions. We often get calls from people who need us to redo or fix an installation and we're glad to help. The sooner you contact us the sooner we can make sure that your gutters are giving your home the protection it needs. Don't worry about gutter guard installation costs. You'll find that our prices are fair and our work unsurpassed. Properly installed, long lasting gutters from Michiana Gutter Pros can benefit just about any building. We can install gutters on any home and if you want we'll put a leaf limiting Gutter Helmet gutter guard on there as well. Do you already have protected gutters installed on your home's roof? That's great but what about your garage, sheds, or other outbuildings? We can install gutters on those as well. After all, they need protection from the damage standing water can cause just as much as your home does. Hanging gutters isn't rocket science, but, it does have to be done right. You've heard the old saying; "if you're not going to do the job right you may as well not do it at all" It's hard to think of many home care and maintenance tasks that are better examples of that truism than hanging gutters. A properly installed gutter with good gutter guards, drain spouts and a drainage system that diverts water well away from the house is a real benefit. On the other hand leaf clogged gutters and drain spouts that dump water right at the base of your home make the problem worse not better. That water that would have simply rolled off the roof otherwise can now cause some real damage. Michiana Gutter Pros always does the job right. You'll never be sorry you decided to contact us today for a free consultation in Mishawaka, IN.